Posted by Phil Groom in Advent and Christmas, Life, News. Which Charity Would You Choose? Like last year, instead of adding to the carbon-footprint chaos caused by billions of ultimately unwanted Christmas cards, we’re sending most of this year’s Christmas greetings without a card or by email only. But this time it’s your choice: where should we donate the money we would have spent on cards & postage? The charity which gets the most votes wins £50, as that’s the amount we think we might otherwise have thrown away: vote here today! We’ve settled in well to the semi-rural lifestyle and we made good friends with the wild birds last winter, but not sure where they’ve all gone this time around. If you see Bedfordshire’s bird population, please tell them there are seeds, fat balls and more waiting for them here. Sue’s role has changed in the diocese following the retirement of her boss — no, not God, the DDO. Sue is now Interim Acting Diocesan Director of Ordinands, which keeps her very busy interviewing would-be priests and helping them as they find their way through the discernment process. At the same time she continues to be Priest-in-charge of Henlow and Langford. She does seem to have a habit of being appointed to jobs which subsequently double in size! Somehow, in between DDO interviews and parish work, Sue has also resumed her DMin studies, except it isn’t a DMin anymore it’s a DThM. Due date is 2012, which should be possible if she takes a sabbatical to write up. This should be feasible thanks to the arrival of the Revd Patsy Critchley as part-time Assistant Curate in November this year. If you follow this blog or Phil’s twitterfeed @notbovvered you’ll know that he left LST in September. Things came to a head in July when LST initiated redundancy proceedings against him and several other members of staff, but rather than wait around to be shown the door Phil managed to find another job: he’s now working for Sainsbury’s in Biggleswade. Started in September: so far so good. A simple routine: go to Sainsbury’s, take stuff off the shelves, give Sainsbury’s money; go back to Sainsbury’s, put stuff on shelves, Sainsbury’s give Phil money. Less pay for less responsibility but immensely liberating and as Biggleswade is within walking distance of home, a substantial saving on travel. Please pray for others made redundant and for those left behind at LST battling their way through the education sector’s financial crisis. Almost is now moored closer to home, at Milton Keynes Marina on the Grand Union. This year’s summer holiday took us from the Kennet & Avon, up the Thames and via the Oxford Canal to the Grand Union. Most enjoyable, especially catching up with a few friends along the way. It was too hot the first week and too wet the second: typical British weather — but at least it didn’t snow! It’s been an interesting year for Phil’s parents, with his Dad having a mini-stroke and his Mum having a hip replacement. The net result is that Dad has slowed down and Mum has got faster. Please pray for them as they readjust to one another’s strengths and weaknesses. This year Ed, one of our nephews, was posted to Afghanistan with the RAF. Please pray for a speedy resolution of the conflict and a safe return home for him and all the troops. Vote now for the charity you’d like to receive our Christmas card money! We’ve selected 5 but feel free to nominate another via the comments below: if other readers shout out for them then they might win instead! Posted by Phil Groom in Life. THIS is where I start work today. They’ve given the store a major overhaul in anticipation of my arrival: it reopened on Tuesday last week, extended from 28,000 sq ft to 45,000 sq ft. I’ll be one of a new intake of 53 new staff on the team. It’s within walking distance of home and I am so looking forward to not having that 2-hour each way commute through London — not to mention the saving in travel costs (though it may cost me a few bob in shoe leather). (and if anyone’s wondering, no, this doesn’t spell the end of my involvement in the Christian book trade: UKCBD and the Christian Bookshops Blog goes on). Posted by Phil Groom in Random Musings, Theological Reflection. 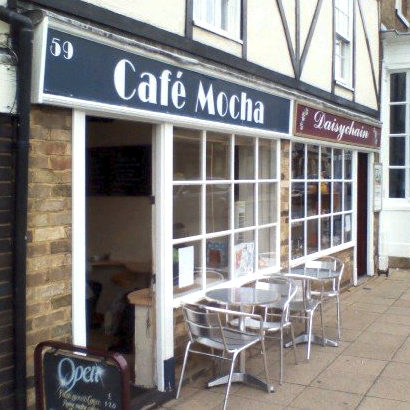 So there I was, doing my stint in Café Mocha, Biggleswade, and a customer was telling me his life story, as they do. If you’ve ever worked in a café you’ll be familiar with this: if you’re willing to listen, you’ll soon become privy to everyone’s innermost secrets. I think the same thing happens in barber shops and hairdressers. Woe to you when all speak well of you, for that is what their ancestors did to the false prophets. Thank you to the good people at the Biggleswade Chronicle (yes, David, Biggleswade really is for real) for featuring both Sue and me in this week’s issue, welcoming Sue to the area and bigging up my dreams for a new bookshop for the area. Sue made page 21 and online, I made page 31. That’s definitely nearly famous in my book.